How big is a chance to meet one of the greatest football players of the present if you are a Russian schoolboy? It appears that it is not so difficult if you play football well. ­A meeting with Ronaldinho is a goal many kids imagine only in their wildest dreams. But that fantasy will become reality for a few young stars from St. Petersburg after they claimed a tournament called "Everyone is Equal in Sport", which was held in Moscow, and won a trip to Italy. The event was put together by international direct-selling company Amway, who are aiming to raise the issue of disability to a higher level in Russia. A few Russian Premier League players showed up to watch their potential future replacements in action. And all of them acknowledge how special an occasion it was for the children. "When I was a kid it was difficult to watch foreign games. My heroes played for Zenit in my native St. Petersburg. I always tried to get their autographs and was happy just to see them near," says Lokomotiv Moscow defender Dmitry Sennikov. Well, Dmitry Sennikov’s young fellow townsmen will travel to Milan next April. These children won the event in a tense final that went all the way to penalties, and the winners did not hide their emotions. 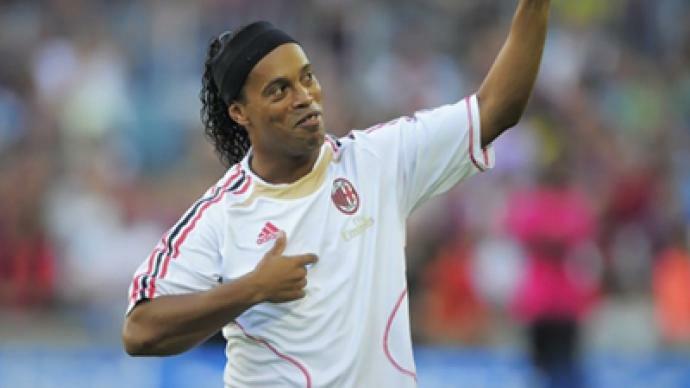 "I love to watch Ronaldinho, I admire his dribbling abilities. I'm looking forward to meeting him,” tournament winner Kostya Sokolov said. Milan's training ground in Milanello will be the place where the star will greet the youngsters. The hope is that more children from Russia will get a chance to see one the world's greatest players in person, as the organizers of the Everyone is Equal campaign promised to make the Moscow tournament an annual one.